Yummy! Perfect for a summer day! Love all your strawberry things, especially the tablecloth. blessings to you today Kitty! Enjoy your time with your son. Kitty, this looks yummy and great idea to keep it in the freezer ready for unexpected guests. I'll file the recipe away for future use. Strawberries are so good right now. Rain, rain, rain here today and we are of course loving every drop. Perfect dessert for this weather. It is ninety today. So refreshing to think of a cool treat right now. Darling mugs and cheerful table. I will definitely be making this soon! Thanks for sharing! It looks and sounds delicious. 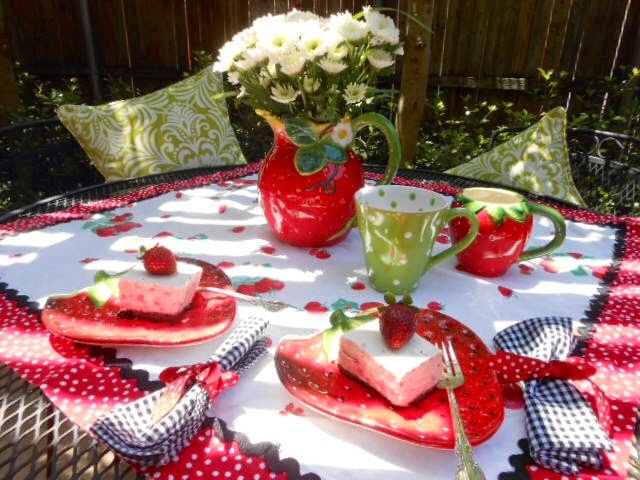 Love your table set with all the pretty strawberry pieces! Oh my...doesn't THAT look refreshing! Perfect for today's 80º+ temps. Love the touch of lime green at your table in the dappled sunshine...so welcoming. Mmmm, your frozen dessert looks fabulous, Kitty! On a warm summer day it would be especially delightful. Your setting is really pretty and would I ever love to sit and join you for tea and some dessert. You always manage to serve up something scrumptious, my friend. Thank you for sharing it with us and joining me for tea. Hope you have a lovely week. Oooh does that ever look delicious! I like the idea of having it on hand for unexpected guests. That would be quite refreshing on a hot summer day. Enjoy your time with your son. I love that strawberry mug, even if my drink might pour down my chin because I'm never a careful guzzler. It all looks so happy and springy to me, and the recipe really does sound delicious. What a fun table you have set. And I can see why your recipe is so special. I may have to try it my self. What an amazing summer setting you did! I love strawberries, so the way this was setup is just amazing to me. Thanks for sharing the yummy recipe! I will have to give it a go! This is my first visit to your blog. What a beautiful blog it is. I love the classic black, white, and red. One of my blogs is devoted solely to classic films, and those are my colors there. They are just so classy! The strawberry dessert sounds delish. It would have been a perfect Memorial Day dessert. Since that is now past, I'm thinking it will work for the 4th of July! I am so trying this recipe Kitty! Thank you for sharing another great sweet treat! Have a beautiful summer love! 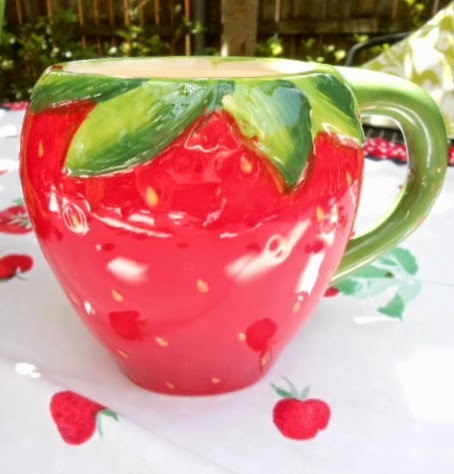 I love your strawberry mug! So cute! Everything looks wonderful. I would love to try the recipe, but can't...sigh...all the good things have milk products in them and I'm just getting over a sinus infection. Rats! But thanks so much for linking to Tuesday Cuppa Tea! Your tea table looks pretty, and your dessert sounds delightful, Kitty. I'm bookmarking this post for future reference. Thanks for the recipe! Have a nice week. This dessert looks amazing! I want some right now! How delicious Kitty. I am amazed at all the dishes you come up with and this one looks wonderful! Such a pretty table with all the "red". So glad you shared this recipe too! Your strawberry tea looks delicious! 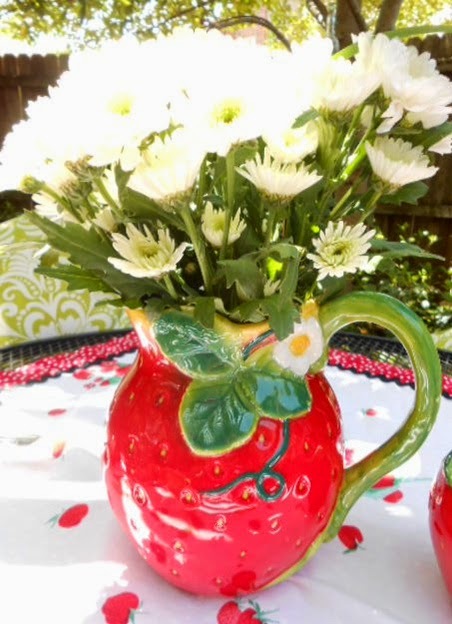 I LOVE the strawberry pitcher--it makes a wonderful vase! The setting is so wonderful too! I think I would be greedy and request the strawberry mug--too cute! The plates and cake both look delicious (and cute)! I am off to get your Texas Sheet Cake recipe since it's my husband's birthday today and I'm making that for tonight :) Thanks my friend. Love to you! I am not showing these to John. He is a strawberry freak, but I might just have to surprise him. That table is summer to the 10th power. Just beautiful...even the cup that might be a challenge to drink from. Looks delish Kitty, and your presentation is wonderful as always. 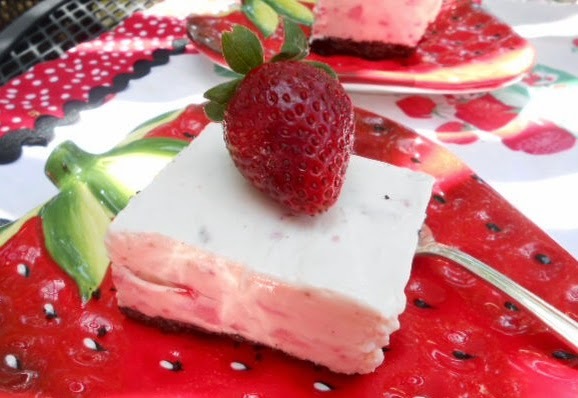 Your Frozen Strawberry White Chocolate dessert looks delicious! Thanks so much for sharing with Full Plate Thursday today and have a great weekend! your dessert sounds wonderful...I love the addition of the white chocolate and the chocolate crust...I make a peach cream pie this time of year and I use a chocolate cookie crust...I think using chocolate is better then your traditional graham cracker crumbs...thanks for sharing! This whole table screams summer Kitty! That dessert looks delicious! YUM! Thanks for sharing with SYC. Wow, I love this dessert, Kitty. It looks delicious and can be made ahead of time. We are just getting into our peak strawberry season and I'm preparing a family dinner tomorrow. Perfect timing, thanks. You are amazing Kitty. Lovely pix and what a yummy dessert. Our local strawberries are out now and a favorite of my husband. I think I should make this for him. Wow, these look amazing Kitty! Perfect for summer. Your dishes are so cute and I love the tablecloth. Thanks for sharing with SYC. Kitty, these look absolutely delicious!! I've already pinned the recipe! :-D Your posts and pictures ALWAYS make me hungry; I bet your family loves your cooking. I also love your tablescape; the strawberry plates, pitcher, and mug are just darling. Did you make the tablecloth, 'cause I love it too. :-D Thanks for sharing with us Kitty and have a wonderful weekend!